This post may contain affiliate links. Thank you for supporting my blog and homeschool! See my full Disclosure statement for more information. 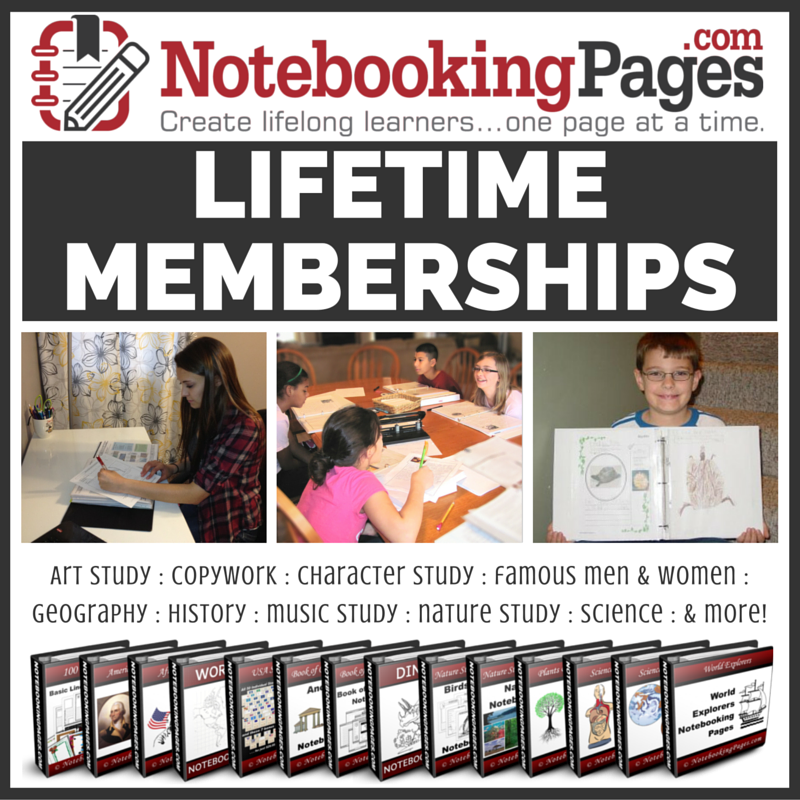 My girls and I loved the Lifetime Membership from NotebookingPages.com. I found that it is a great way to enhance learning while also creating a beautiful portfolio that will be a display of everything that you have learned. What is notebooking? Well, I am so glad you asked! Notebooking is keeping a compilation of what you have learned by: reflections, sketches, pictures, notes, short stories, etc. This is different than simply taking notes, or even keeping a diary. Notebooking is a way cement the learning process through multi-sensory methods. I want you to understand that there are a lot of benefits to notebooking for your child. I think the biggest thing it did for my girls was relieve the stress of traditional methods of learning. In brick and mortar, you are required to simply memorize information and then regurgitate it all whenever asked. Notebooking helps bring the stories to life in a more relevant way....which in turn leads to lifetime learning. As your child captures new knowledge through a variety of methods and stores it in the notebook, you will see a love for learning grow! Our kids want to not only be successful in their education, they want to feel successful! All the current notebooking products...and they are nearly innumerable. You can take your pick from: Art Study, Famous People, Geography, Modern Times, Music, Science, History, and much more! All the future notebooking products...anything that comes out in the future is available to you without having to do anything else. It will just become available as it comes out. Search bar & Table of Contents....this is so great, because it makes it so much easier to navigate your way through all the available pages, and find just what you need. 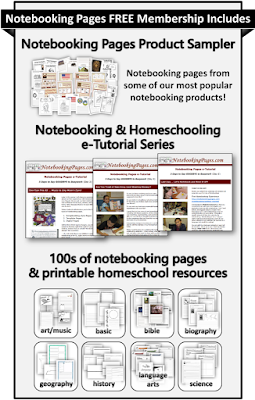 Tutorials, Tips and Videos...I love that you have access to all the homeschooling tips and videos. 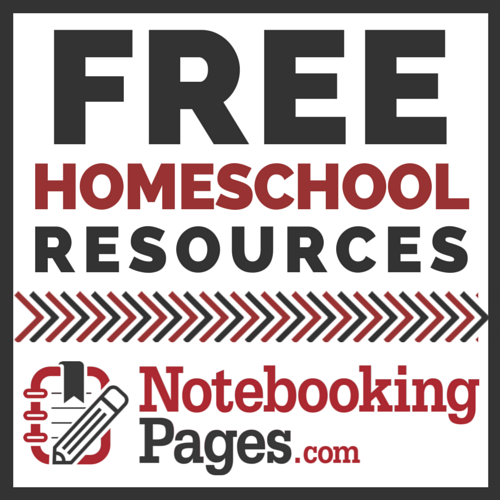 This is a wonderful resource and will impact your homeschool for the good. Unlimited Lifetime Access....I love that this membership is a Lifetime Membership. That takes the pressure off when it comes to downloading and using the product. This way you can use what you need when you need it without any hassle or deadlines!! With my girls on summer break, we utilized this product in a "freestyle" manner and I allowed them to use it as they chose. I gave them the guidelines and time-frame parameters and then left them to it. I loved that we were able to use this as a summer learning program of sorts and increase our knowledge during what would have normally been an "off" time! They bounced around between the topics, but absolutely loved these notebooking pages. My oldest loves to write and found that the pages which allowed her to write short stories or create poems were her favorite. My youngest is not that fond of writing and she found that color pages were her favorite. So even though their interest and personalities are different, what I found similar was their love of this product. 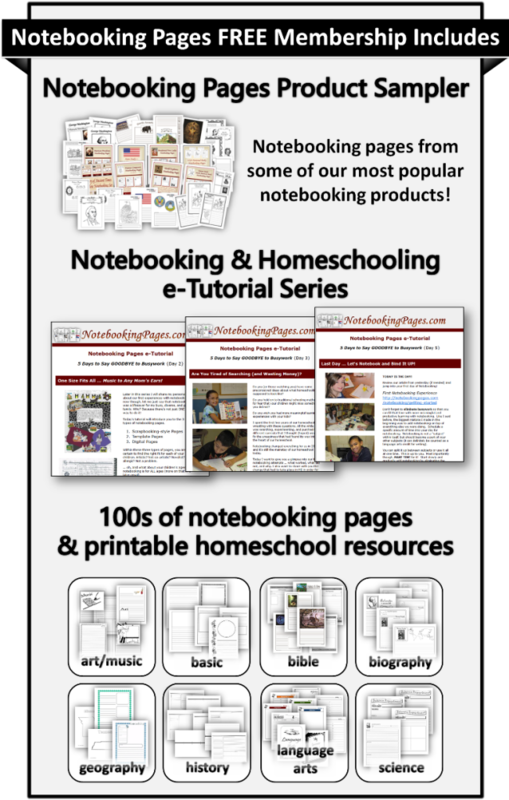 With notebooking being a fairly new idea for us and our homeschool, I found this product to be top notch. Not only because of the fact that the pages are well thought out and creatively done....but because of the vast number of them. This product is so versitile and wonderfully crafted...you can put it to use anywhere in your homeschool and see it impact your child positively! If you want to find out a little more about NotebookingPages.com click here. You can also check them out via their social media links.